Part two of this S.H. Figuarts Mighty Action X Beginning Set review continues with genius surgeon Hiiro Kagami – aka Kamen Rider Brave Fantasy Gamer Level 2! Using the Taddle Quest Gashat, Hiro fights as part of CR to help contain the Bugster outbreak – working alongside Emu Hojo/Kamen Rider Ex-Aid (albeit begrudgingly at first) as well as sharing a heated rivalry with Taiga Hanaya/Kamen Rider Snipe following the events of Zero Day. Like both Ex-Aid and Snipe, Bandai Tamashii Nations initially released Kamen Rider Brave as part of this special mass release 3-pack before an individual release the following month. Meanwhile Brave's individual box is considerably different, with a bit more flourish as well as the usual S.H. Figuarts packaging image placement. Taddle! Meguru! Taddle! Meguru! Taddle Quest! The Ex-Aid Riders don’t feel that far off from the aesthetic Bandai have adopted for their SD Gundam range to begin with, but with his medieval knight motif Kamen Rider Brave definitely fits right among them. Whereas Kamen Rider Ex-Aid himself has a rather basic frame, Brave is decked out in a number of different thematic flourishes such as his stereotypical knight’s helmet, shoulder pauldrons and left wrist gauntlet. However you also have the health bar chest plate, striped undersuit and sneaker-like feet that run through all of the Ex-Aid Riders, giving them a uniform look as well as making them unmistakably game-themed. As was the case with Ex-Aid, Bandai have chosen to do Brave’s body up in a beautiful metallic finish that really makes the figure pop far more than simply a flat blue could achieve. Again the overall look is fantastic, with both the printed and moulded details sharp, colourful and eye-catching. Keen-eyed collectors have been quick to point out that there is one minor inaccuracy with this figure though – the colour section should actually be white whereas it’s been left silver here to match the rest of the chest plate. It’s a bit strange this detail was overlooked (especially since the LVUR2 figure managed to get it right), but personally I don’t find it ruins the figure as the discrepancy between the white and silver is small enough to mostly go unnoticed unless pointed out. With Brave sharing the same base body as Ex-Aid, he naturally exhibits the same high level of articulation despite the aesthetic changes made to suit the knight motif. The modern style hip joints really make a difference to these figures, and it’s massive shame that other new figures like the Amazons range or the 2016 Rider 1 had the swing-down variety instead. On top of that Brave also has the usual Figuarts range of movement, allowing the figure to be put into all manner of great poses. As well as the head issue previously mentioned on Ex-Aid, Brave’s shoulder pads are also a little more fiddly due to their added size – making them far more prone to popping off when posing. Thankfully the double-clip joint system works just as great as ever though, so there’s no worry of them ever getting in the way of the shoulder and arm movement. 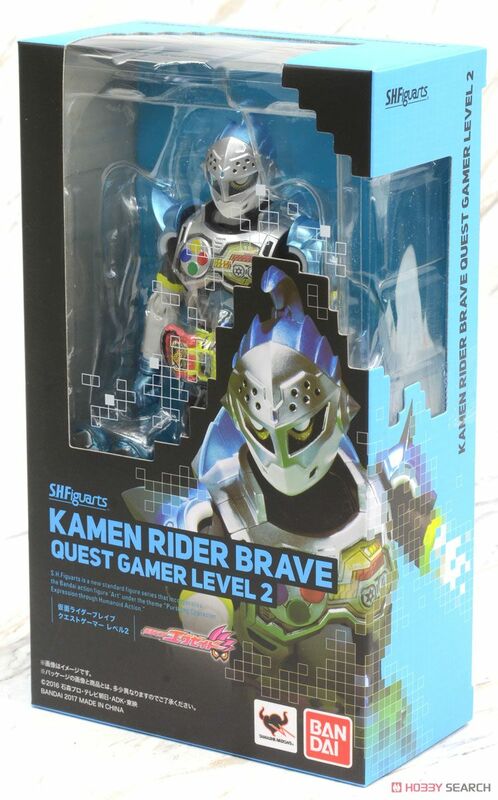 Brave’s Gamer Driver features a hinged lever, as well as a removable Taddle Quest Gashat that can also be plugged into either the Kimewaza Slot on the side of the belt or Brave’s Gashacon Sword weapon. Other than being the correct colour the Gashat isn’t especially accurate, not only lacking any sort of Taddle Quest graphics but also sporting a shorter cartridge section to (presumably) allow a securer fit into the various components. It’s a bit disappointing given how accurate various transformation trinkets have been in the past, but given how easy it is to lose these things a tighter fit is arguably far more important than a little bit more accuracy. Kamen Rider Brave comes packaged with an impressive five pairs of alternate hands (the most out of the three figures in this set) and the Gashacon Sword. The selection of hands is pretty much the usual Figuarts range, including closed fists, weapon holding and a few pairs of signature pose hands (including the all-important “Begin Operation” hands). The Gashacon Sword operates just like the onscreen version and roleplay toy, featuring a two-side fire and ice blade which can be turned accordingly. With the show often using a single-sided version when the gimmick isn’t being shown off some collectors’ assumed Tamashii Nations might include swappable blades, but this was clearly not the case. Personally I think the gimmick version of the sword is a much better inclusion, since it properly replicates how the sword works in the show and adds a little bit of interactivity to the figure as well. Turning a sword blade around 180 degrees really shouldn’t be this fun. S.H. Figuarts Kamen Rider Brave is another winner for the Kamen Rider Ex-Aid line, proving that even if the show’s costumes may be somewhat divisive that the figures themselves are unequivocally excellent. Between that superb knight motif, the gorgeous colours and impeccable moulding Kamen Rider Brave is a near-perfect figure for one of the show’s standout characters. One accessory may not seem like much, but between that and the great range of hands Brave undoubtedly comes with everything needed. Knight-themed Riders aren’t all that uncommon in the Kamen Rider universe, but they’re rarely as unique as this.